One of my nerdy brothers recently had a birthday. 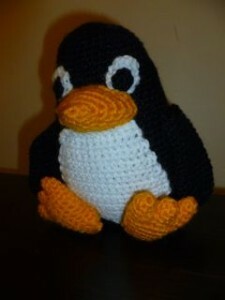 I asked my other nerdy brothers what I should crochet for him and they suggested Tux, the Linux penguin. So here it is, the cuddliest logo in the IT world. 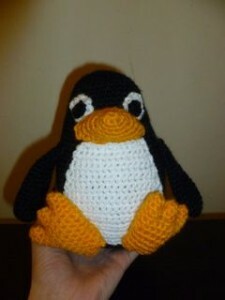 Tux’s pattern is written in American crochet notation and requires a 4mm hook and 8ply wool. Round 50: decrease until the hole closes. Slip stitch in the first stitch. Fasten off, leaving a long tail for sewing. Round 12: Sc in every stitch except with a decrease at each end of the foot (10 stitches). Fasten off, stuff, sew closed. Sew the pupils to the eyes. Stuff the beak and sew it onto the head. Sew on the tummy. Sew on the feet and wings. Don’t stuff the wings. Give your nerdy little penguin a cuddle and put him near the computer where he’ll feel at home. this is adorable i love i’m not a professional but this is amazing thank you so much for the free pattern.